Hibernian head coach Alan Stubbs believes title rivals Rangers are now taking the Easter Road side's challenge seriously. Stubbs' men drew level on points with the Scottish Championship leaders by beating Queen of the South on Saturday. 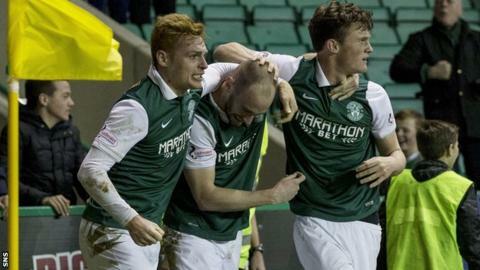 And Hibs travel to face Rangers at Ibrox on Monday. "If they weren't thinking about us a month ago, I think their mindset has changed and they are certainly thinking about us now," said Stubbs. "The noises that are coming out are slightly different now. I think that tells you something. "You can deny it all you like but we have been there, we have stayed there, and we weren't going away. And we're not going to go away, whether you like it or not. "You can deny it all you want but our intention was to stay there and try and put as much pressure as we can on Rangers. "Let's be honest, I don't think they ever ignored us. They told everyone they were but I don't think they did. "Sometimes you say things but players look at tables, they look at our results, and they know our form is very good. They knew where we were. There's only so many times you can keep denying it." Rangers gave Hibs the opportunity to draw level after losing at Falkirk on Saturday lunchtime and drew with Greenock Morton the week before. "I still think both teams have shown big-game mentality," Stubbs added. "Rangers have had a few results recently which haven't gone according to plan. But I would say, rather than Rangers dropping points, I think a bit of credit has to go to us because we have been gaining momentum and picking up maximum points. "And when you do that, are you trying to tell me that when you finish a game at 16:50 on a Saturday, that you don't look at other results? "We're excited about the proposition of going to Ibrox and so we should be. Through all the talk and the hullabaloo, it's two good teams, two teams that play football, and I'm expecting a fierce battle."